Saiburi, Thailand – With his hands tucked in his jacket pockets, Anas Pongpraset slightly nods towards two collapsed buildings in front of him. 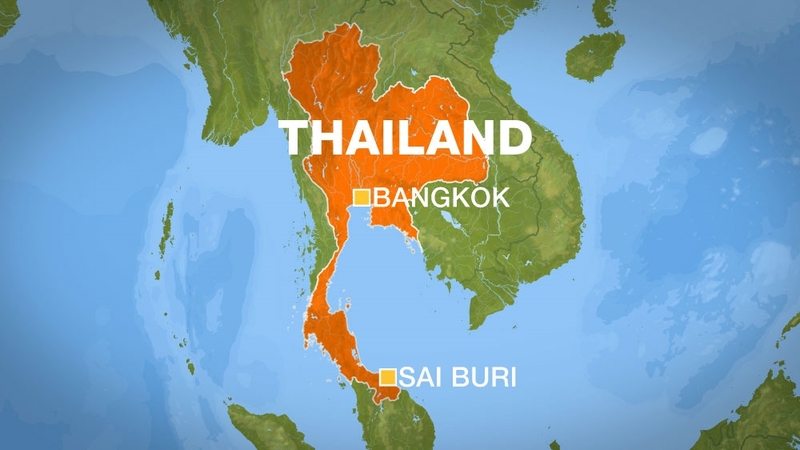 “That’s where the car bomb went off,” says the 35-year-old of an explosion that rocked the Chinatown district of the small town of Saiburi in Thailand‘s deep south in 2012. “It killed both Buddhists and Muslims. There weren’t any clues that it would happen here in the Chinese community,” he adds, his gaze fixed at the charred structures. Fighters have been waging an armed campaign for independence in Thailand’s deep south for decades, but the conflict escalated in 2004 after a series of well-planned attacks on police and government facilities. Explosions, gunfire and organised killings shook the region as the rest of the country watched in horror. The violence has since kept Thailand’s military on edge, yet it has caused more than death and destruction. It’s also left broken communal ties throughout the southern region, a large and diverse area that’s home to various ethnic groups, including Chinese, Thai Buddhists, Pakistanis and Thai Muslims, who make up the majority of the population. Saiburi has been particularly hit. It’s been designated as a “red zone”, indicating that the town is more prone to be struck by violence than others. 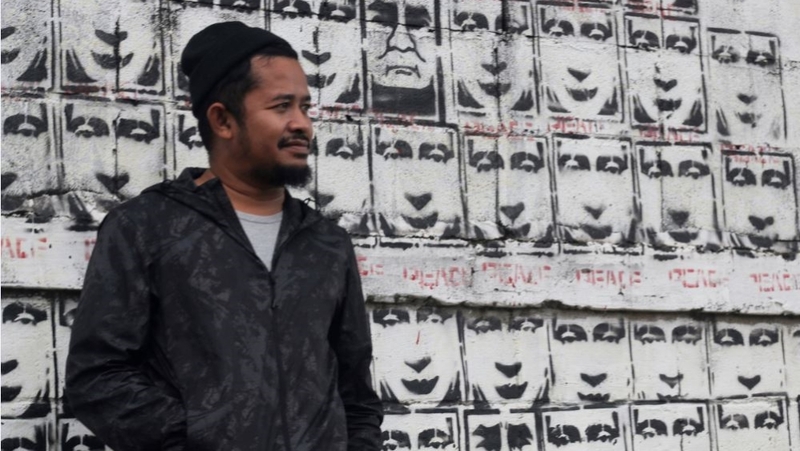 “I watched as my hometown erupted in violence on the television set,” says Anas, recalling the clashes that hit Saiburi some 15 years ago when he was a student in Thailand’s capital. “I would see the news from Bangkok and felt depressed that there was so much violence coming from the south,” he adds. The filmmaker and photographer says he couldn’t just ignore the lingering remnants of violence and the continuous aggression by both the Thai military and the separatists for any longer. So he decided to act. 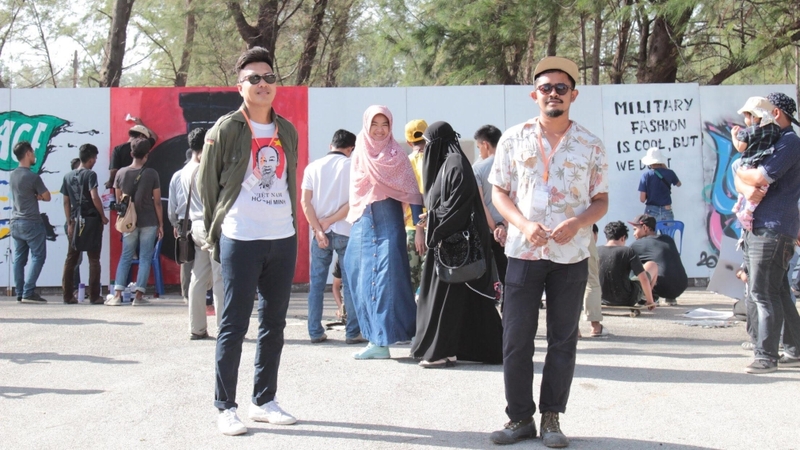 Joining forces with other like-minded people, Anas in 2012 founded Saiburi Looker, a collective of young artists working to rebuild communal relationships and promote peace in the south through art. 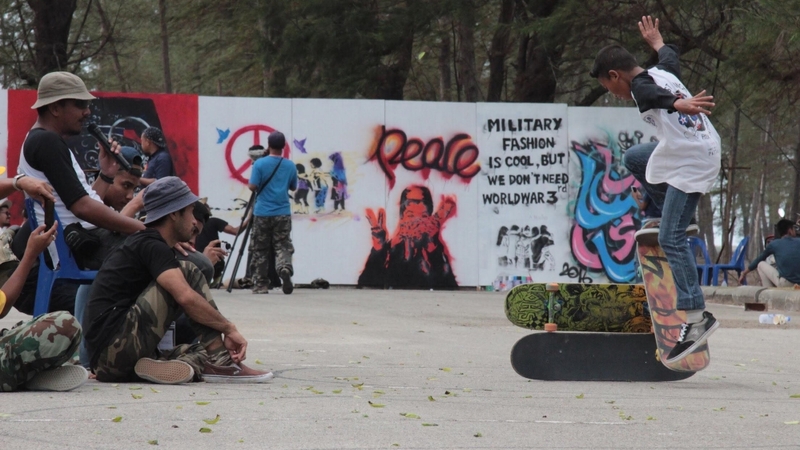 The group’s activism started with artist Waearong Waeno courageously painting elaborate drawings representing peace on public walls throughout Saiburi. In a way, his paintings were the first act of silent defiance aiming to soothe the tension that permeated through the town’s streets. Historians trace the origin of the conflict to around 1909, during Thailand’s annexation and takeover of the Malay Sultanate of Patani. They say it began when the northern states of Malaysia were cut into separate pieces by the occupying Thai forces. After the annexation, forced assimilation procedures created resentment among the local populace. It didn’t take long before armed campaigns by separatist groups started appearing in the 1950s with tensions brewing over the following 50 years. In 2004, groups such as the Barisan Revolusi Nasional Melayu Patani (BRN) increased attacks against military, government officials and teachers. The situation deteriorated around 2012 when fighters began purposely targeting civilians from differing minorities as well. They deliberately planned attacks that would cause communal tension creating a new sense of distrust and Islamophobia towards the majority Muslim population, according to Anas. He says that prior to 2004, the various communities in the area coexisted without any major problems, adding that it’s likely that those attacks were orchestrated to destabilise communal relationships. “Nobody trusted each other. We didn’t know who could be listening to our conversations. Everyone was scared to express themselves and there was this general sadness and fear,” Anas says. He knows all-too-well how distrust can tear communities and families apart. Anas’s grandfather was a prominent Muslim leader both in the south of Thailand and in neighbouring Malaysia. But his grandfather’s brother was on a military list of “extremists”. Thailand’s security forces harassed and investigated his family often, disrupting their daily lives under false suspicions that they were connected to armed groups, Anas says. It is cases like this, he adds, that broaden the sense of distrust between local Muslims and the military. Violence between the fighters and the military has continued to grind over the years and persists to this day, with civilians often caught in the middle. Just this week, the BRN, which spearheads the fight for independence, released a statement renewing the group’s commitment to their cause of “freedom” while also calling for more people to join the movement. Since 2004, the conflict has resulted in more than 6,000 deaths, with some 20,000 documented attacks. Deep South Watch, a monitoring group, reported 45 incidents of violence and 26 deaths from the conflict in their latest update released in November last year. Zachary Abuza, a specialist on the ongoing conflict and professor at National War College, says one reason why the fighting continues today is due to a lack of meaningful dialogue or compromise between the military and the separatists. According to Abuza, communication between the military and the BRN has gotten worse in recent years, especially after Thailand’s current military government took power in 2014. He says the government has made fewer concessions to the fighters, resisting any semblance of compromise that could perhaps help ease the violence. “The government made clear that autonomy was not on the table, they refused to implement language reforms, they have refused to have general amnesties,” he told Al Jazeera. “Basically, the junta’s view of peace is that the militants surrender, without any meaningful concessions being made to address their core grievances. That’s why the conflict drags on … The insurgents, who have very limited resources, can escalate the violence when they want to remind the government that there are costs to not taking them seriously and stalling,” Abuza says. Against this background, Saiburi Looker’s members have stepped up their efforts to promote peace using art as their weapon. Their varied events include concerts in which local musicians are encouraged to come together and perform live – anything from blues and jazz to pop and local country music. They have also staged poetry slam events, in which participants read aloud poems on how the conflict has affected them – a form of therapy for many of those presenting, according to organisers. Saiburi Looker’s artists say one theme has continued to appear more than any other in their events. The idea that locals in the deep south were no different from any other Thais in the country and simply wanted the same thing as everyone else: a normal and peaceful life. The group also takes an indirect approach to combatting violence. Anas says that both the military and the armed groups are not opposed to their events, stressing the importance of remaining independent in order to be inclusive of everyone. “We want people to know that we’re the same as anyone else,” Anas says, with a sense of urgency. “There’s a lot of Islamophobia in the country. Yes, we’re Muslim, we have beards and dress differently, but that doesn’t mean we don’t do all of the same things as other Thais. 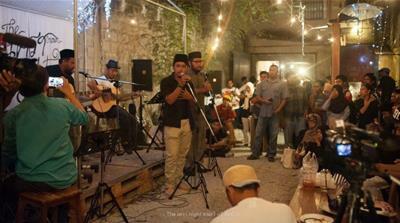 We all love music, writing and art in the same way any Thai does,” he adds.